This deliciously refreshing tart is simpler to bake than you’d think, and it rounds off a summer lunch perfectly. 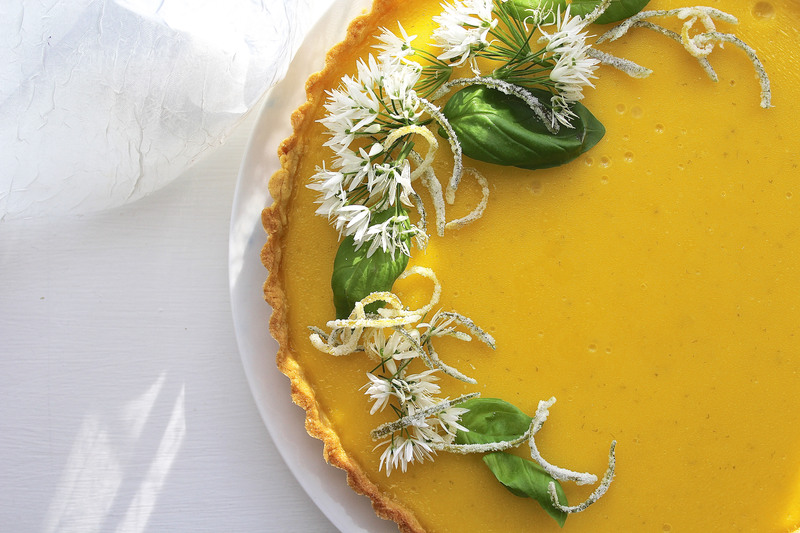 A classic lemon and lime filling encased in sweet short pastry is always a crowd pleaser, but the basil added to this one balances the sharp citrus with a sweet aromatic flavour; a great twist on a much loved warm weather dessert. First off, make the pastry (you could buy shortcrust pastry instead of making this special sweet variety yourself- if you do, just follow from step 2). The easiest way to do this is to place the flour, sugar, butter and salt in a food processor and blitz together until a breadcrumb-like consistency is achieved (or rub together with your fingertips, handling as little as possible). Once you reach this stage, add in the egg yolks and blitz again, very briefly, until the mix just comes together to form large lumps. Tip the pastry out onto a clean surface and shape (again handling as little as possible) into a thin disc. Now wrap this pastry disc in cling film and chill for 15 minutes. Preheat the oven to 190c. Very lightly grease a 22-24cm tart tin with butter. Take your pastry and roll out on a floured surface to a little under 3mm thick. Line your tart case, using a ball of spare pastry to push right down into the corners. Run a knife around the top of the case to neaten the edges. Chill for 20 minutes. Fill your pastry-lined tart case with non-stick baking paper and baking beans then blind bake for 10-15 minutes (until the walls are set). Remove the paper and beans and return to the oven for 5-10 minutes until the pastry is cooked through and the base is sandy and dry but not overly golden. Now it’s time to make your filling. Reduce the oven temperature to 150c. Place your eggs, sugar, zest, juice, cream and whole bunch of basil in a saucepan and leave off the heat for 10 minutes. After 10 minutes some scum will have formed on the surface; skim this off with a spoon then place the saucepan on a gentle heat. Warm until hot to the touch (not boiling), then sieve to remove the basil leaves and zest. Pour this filling into the prepared pastry case and bake for 15-25 minutes until the middle has a uniform and slight wobble when gently shaken. Cool completely in the tin to allow the filling to fully set (this will take an hour or so) then remove carefully, slice up and serve. Decorate as desired and keep refrigerated once cool. Lovely!!! 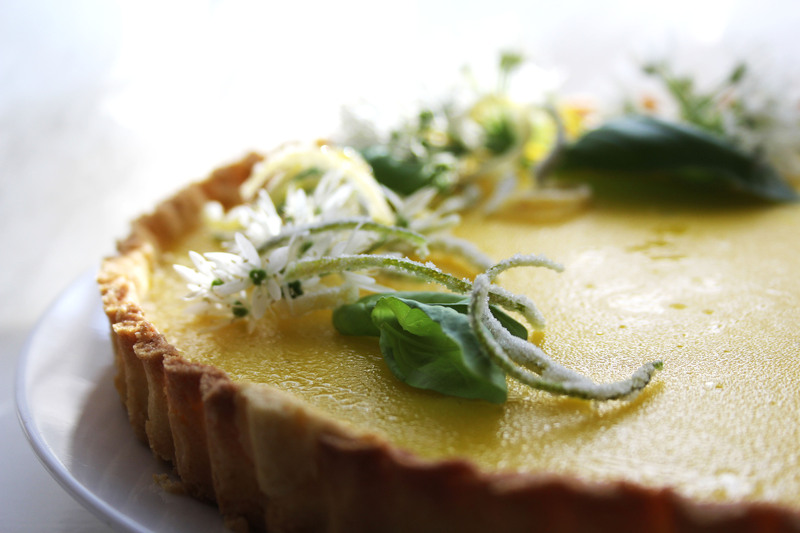 Interesting use of Basil with lemon must make this tart really delicious! !